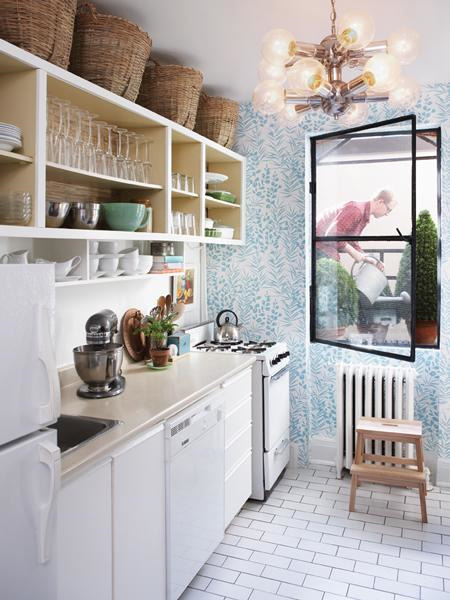 Rustic baskets above the shelves and a mod '60s light fixture emphasize the height of this kitchen. He found the light fixture at a vintage store for $100! A secondhand cabinet from Craigslist stands in as a stylish and budget-savvy island. He decided to leave it alone and not "gunk it up with paint." Pegboard offers valuable storage space. Vintage chairs—recovered in a menswear-inspired Robert Allen fabric—add a bespoke touch to this space. Color-blocked books add punch to white shelves and collectibles. 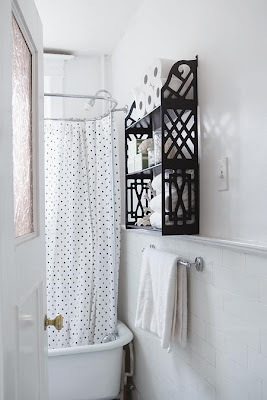 This is on my list of things to try in my own home one day! 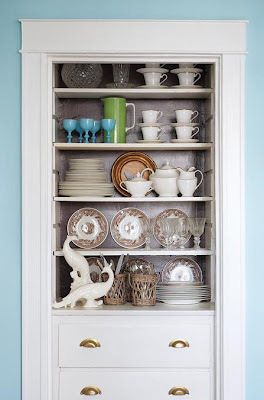 Painting the back of this built-in hutch makes china, antique goblets and collectibles stand out. A vintage painting, trophy, mirror and woven basket add texture and eclectic charm to this living room mantelscape. When digging through a second-hand store he suggests going over an area more than once, in case you miss something the first time. Simple white bedding allows the printed drapes—a steal at $12 a yard—to steal the spotlight. 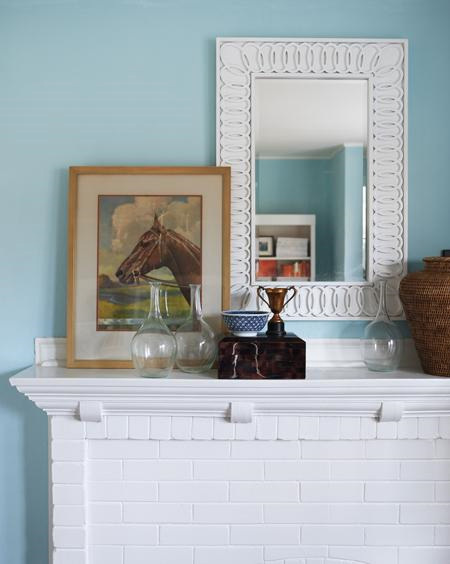 He painted the ceiling an intense robins-egg blue which make the white walls pop. A clawfoot tub and wainscoted tile add charm, while the all-white palette keeps the look fresh. 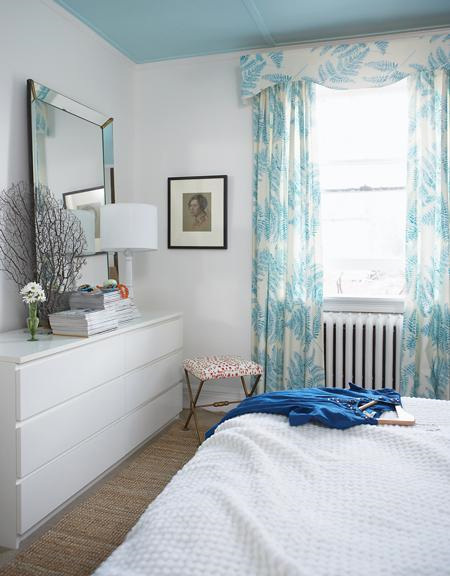 A wide and preppy striped wallpaper wakes up this room. "Our 'headboard' is panels from a vintage door, mounted to the wall and framed with MDF," says Michael. "The glam pulls for the bedside tables came from eBay — just $20 for four!" Crisp white bedding and lampshades tie the look together. 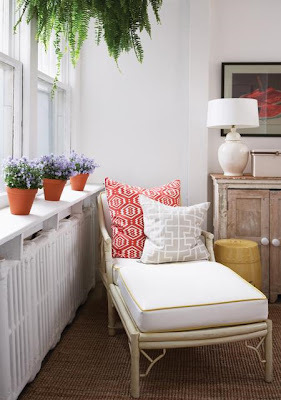 A chinoiserie thrift-store chaise, drum stool and patterned cushions evoke a air of genteel splendour. He added a new shade to the $6 second-hand lamp. I recently colorblocked my books ... One of the easiest and best things I've done to improve my office space. Definitely worth the time! :) Lovely home, as well. 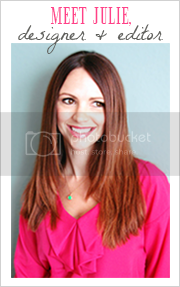 ahh I love these color combinations! especially the light blue and white! so light and airy! Great house. 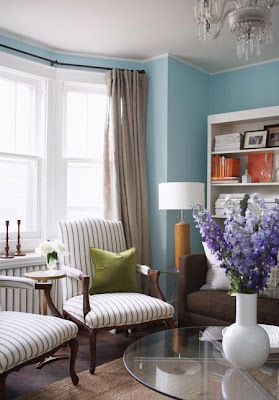 Love the colour scheme and the thrift finds are fab. 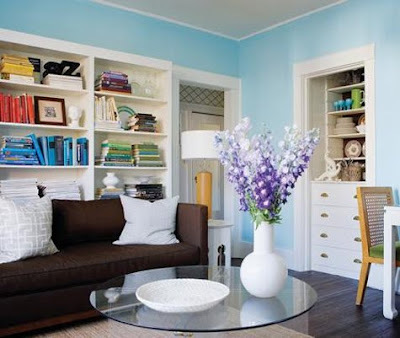 I especially love the living room with the books colored cordinated! Fabulous home love it :) Love the shades of blue and the mix of old and new. Some lovely ideas there. Thanks for sharing. He's one stylish man!! Peg boards are the ultimate organizer! The one in my art studio is 5' by 8' large!! Love the turquoise and the brown stripes so fun! Have a wonderful weekend! Great home - thanks! 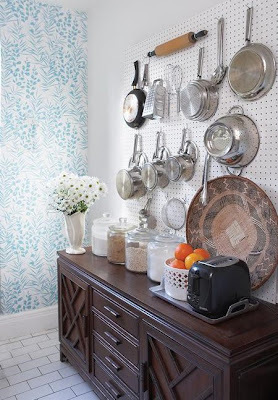 I'm really loving striped wallpaper at the moment..... dying to try some out at my place! I like his living room and bedroom, they look very calming and peacful... I can imagine it to be relaxing to be in those rooms. julie, his space is so fabulous! this is what i mean by pieceing a space together. not and interior designed space, just pieced together. it's how i think of my own way of approaching a space. my thought is to always lean towards the eclectic, some old, some new and some in between all of that. love this post! Really pretty. The striped wallpaper is a strong contrast to the more interiors in the kitchen and other parts of the home. What an inspiration! 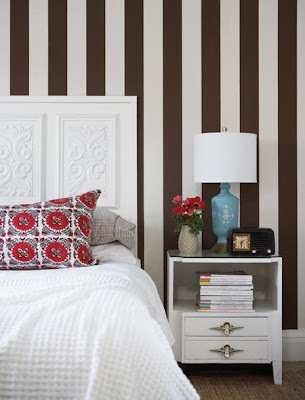 Love the brown stripey wallpaper! Hope you're having a lovely weekend! My fav part of the house is hands down the kitchen. its so beautifully done! the choice of lighting, the wallpaper, and that sweet little window that looks out to the terrace. ahh love!